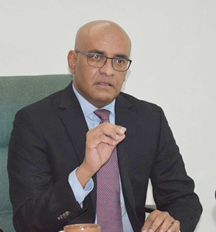 The Leader of the Opposition, Bharrat Jagdeo, contends that public officials should be jailed for failing to make public, negotiations and transactions with any oil company. He was, at the time, responding to questions from Stan Gouveia on Radio 94.1 FM, on Friday last. During the interview, Jagdeo rebuked contentions raised by members of the A Partnership for National Unity + Alliance for Change (APNU+AFC) coalition that he is trying to “get his hands on the oil money”. He said that, if anyone wants to get one’s hands on the oil money, it is this government. He said that this was illustrated when the government hid the US$18M signing bonus it received after signing off its contractual arrangement with Esso Exploration and Production Guyana Limited (EEPGL), a subsidiary of ExxonMobil. The contract was signed in 2016 but the general public only found out about the bonus over a year later, in 2017. 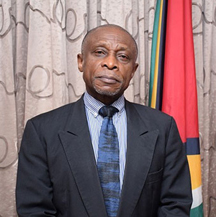 Minister of Foreign Affairs, Carl Greenidge, had told the National Assembly that the Fiscal Management and Accountability Act (FMAA) specifically provides for public monies to be held in extra-budgetary funds and deposit funds until they are credited to the Consolidated Fund. Jagdeo had accused Greenidge of misleading the public, since the Act also requires the fund and its source, upon its establishment, to be reported to the National Assembly. “They took the US$18M and hid it, then Jordan said, ‘We never requested it, nor did we receive it’,” Jagdeo said. He recalled that they had put the signing bonus into an account that was not the consolidated fund or the central bank reserves. Until today, he said that this money has not been recorded in the consolidated fund. The government had later indicated that the money is being used to pay legal fees at the International Court of Justice (ICJ), in Guyana’s bid to protect its sovereignty over the Essequibo region from Venezuela. Jagdeo scolded the government for hiding the signing bonus from the general public, and for claiming that they hid it for national security reasons. He said that, when news reached the public, “the sky didn’t fall”. Further, he said that if these officials fail to do so, they would face 10 years’ imprisonment.